Over the last few years, we have tried to “demystify” primary consciousness by combining neural and philosophical aspects of the problem into a unified view of how feelings are created in a naturally biological way. Our analysis leads us to the view that the puzzle of consciousness and the explanatory gap actually has two related aspects: an ontological aspect and an epistemic aspect and that both have a natural and scientific explanation. First, we consider the ontological aspect of the problem. This part of the puzzle entails what philosopher John Searle called the “ontological subjectivity” of consciousness. This is the idea that consciousness has a unique and fundamentally “first-person” ontology—or mode of being—in that feelings only exist when experienced by an animal subject. The implications of this view would be that no manner of objective scientific explanation, no matter how complete, would “explain away” the neurobiologically unique subjective feelings that are associated with certain brain states—in other words how things feel. The challenge here is to explain this unique aspect of feelings in a way that is consistent with an entirely scientific world view and do so without invoking any new or fundamentally “mysterious” physical principles. Our explanation of this first aspect of the explanatory gap invokes two factors. The first factor is that consciousness and the creation of feelings are fundamentally grounded in general life functions. Just look at all the basic commonalities between life and feelings. For instance, both rely on complexly organized chemical and physiological processes, and both are embodied; that is, each living thing has a body with a boundary from the outer world. So just as life requires a bounded body for survival, consciousness requires such a body for the creation of a personal (first-person) point of view (See, for instance, Evan Thompson’s book Mind in Life). Then, beyond the general life functions, we see that conscious feelings also need an animal body with many cells, a nervous system and even a basic, core brain, although these things are not enough for consciousness. The second factor in our explanation of the ontological aspect of the explanatory gap is that to these general features are added numerous and neurobiologically unique special neurobiological features of complex nervous systems, especially of complex brains, that all together create consciousness. The special neurobiological features that we identified include an explosion of senses (eyes, good hearing, keen smell), a multitude of new neural processing subsystems, more combining of information from the different senses, more levels of information processing at the top of the brain, more back-and-forth communications between brain levels, and more memory. From these neural features arise consciousness in a way comparable to how the complex property of life naturally arises from the interactions of its chemical and cellular components. But how do we identify these particular features as indicators of consciousness? We first assumed that any animal that uses complex senses to create a mapping of the body and the world has the capacity to create mental images, and these feelings are considered by many writers on the subject including Gerald Edelman and Antonio Damasio to be one marker for sensory consciousness. 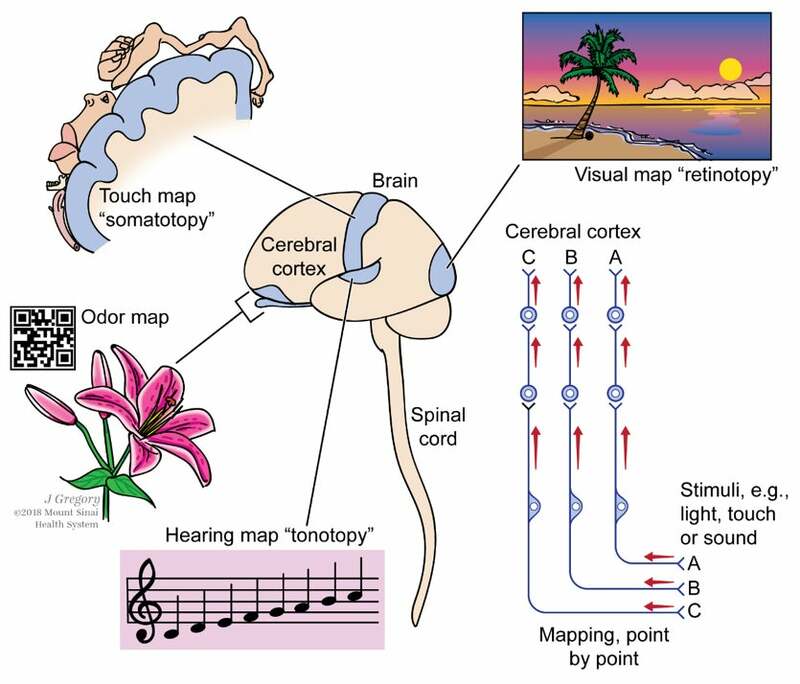 These mappings are often referred to as isomorphic maps, and include among others the “somatotopic” maps of the body, the retinotopic maps of the visual system, and the cochleotopic maps of the auditory system (Figure 2). Second, we posited that an animal that shows complex operant conditioning (learning from experience based on rewards and punishments) possesses positive and negative feelings or affects. In our analysis we found that the only animals that passed both tests were the vertebrates (including fish), arthropods (insects, crabs, etc.) and cephalopods (e.g., octopus, squids). When we looked more closely at these animals we find that they share all the special features we listed above. So the solution to the ontological aspect of the explanatory gap is that all feelings are both uniquely personal via their connection to life, and they have a unique neurobiology through the special features. And the two in combination create the unique feature of conscious feelings. Note this explanation requires no supernatural intervention nor any new “fundamental property” or principle of physics. However, while there was a seamless and natural evolution of consciousness, we also find that feelings and their neural substrates are extremely diverse and widespread. This is true within a brain: in mammals, for example, the brain areas for the many kinds of perceived images (cerebral cortex) largely differ from those for the many kinds of affects or emotions (subcortical areas). As elegantly shown by the work of evolutionary biological Richard Northcutt, this diversity is also true across animal groups: the vertebrates, arthropods, and cephalopods evolved their brains independently and the regions involved with consciousness are in different relative locations in their brains. Thus, conscious feelings can stem from very different brain substrates. Most importantly for our theory, all this neurobiological diversity—in the types of feelings and in their widespread neural substrates within and across species—means that there is no single, parsimonious neurobiological explanation of feelings and there are many and varied pathways to the creation of feelings. But there is another aspect to the explanatory gap, which arises from the ontologically subjective existence of feeling that we addressed above. This second aspect is an epistemic (knowledge) gap between subjective first-person experience and third-person explanations of brain processes. The aspect of the gap also involves the differences between subjective, first-person experience, and objective, third-person explanations of brain processes, but is not quite same as the ontological questions. We attribute this second epistemic aspect to the barriers of auto- and allo- irreducibility (Figure 2). Auto-irreducibility means that once conscious is created, we have no knowledge of what neural processes are causing our experiences. In other words, we have no direct access to our neurons, only to the experiences they create. This barrier was first pointed out by Gordon Globus who called this an aspect of the “world knot,” a term coined by Schopenhauer to describe the multiple enigmas that are confronted when trying to explain the relationship between the brain and consciousness. But there is nothing mysterious about auto-irreducibility. This gap exists because, as pointed out by Globus, the brain does not encode or represent “in any way its own structure. (The nervous system has no sensory apparatus directed to its own structure).” Therefore, auto-irreducibility has a clear physical explanation: the neural connections are simply not there. But unlike the first gap, this is an epistemic gap, about knowledge, because we do not have knowledge of the physical neurons that are creating our experience. Allo-irreducibility is the reciprocal epistemic barrier; namely, when we take on an objective, third-person point of view, we cannot directly know someone else’s conscious feelings as they subjectively experience them. This creates an additional epistemic gap between first- and third- person perspectives on the brain. But once again this epistemic gap has a non-mysterious explanation: for one thing, there is no physical connection between separate brains. We conclude that the “mystery” of consciousness and Levine’s “explanatory gap” and the “hard problem” can be naturally and scientifically explained. Our theory hinges on the propositions that consciousness and subjective feelings can be ontologically subjective and neurobiologically unique yet scientifically explainable, and that this creates an unbridgeable yet scientifically unproblematic divide between first- and third- person knowledge of the brain. At the same time, it continues to explain how while subjective experience is unique in nature, there is no need to invoke unknown forces, either physical or nonphysical, to account for its creation. Feinberg, T. E., & Mallatt, J. (2016a). The ancient origins of consciousness: How the brain created experience. Cambridge, MA: MIT Press. Feinberg, T. E., & Mallatt, J. (2018). Consciousness demystified. Cambridge, MA: MIT Press. Globus, G. G. (1973). Unexpected symmetries in the “world knot.” Science 180, 1129-1136. Levine, J. (1983). Materialism and qualia: The explanatory gap. Pacific Philosophical Quarterly 64(4), 354–361. Todd E. Feinberg is Clinical Professor of Psychiatry and Neurology at the Icahn School of Medicine at Mount Sinai. He is the author of numerous publications on the brain, behavior, and consciousness, and is the co-author with Jon Mallatt of The Ancient Origins of Consciousness. How the Brain Created Experience (MIT, 2016) and, most recently, Consciousness Demystified (MIT, 2018). Jon Mallatt is a Clinical Associate Professor of Medical Sciences in the University of Washington School of Medicine's WWAMI Program at the University of Idaho. His long-term research is on the origin and evolution of the major groups of animals, including consciousness in animals. Mallatt is the co-author with Todd E. Feinberg of The Ancient Origins of Consciousness. How the Brain Created Experience (MIT, 2016), and, most recently, Consciousness Demystified (MIT, 2018.